At the October 25/26 meeting, JLI’s overall goals were reaffirmed and we were encouraged to prioritize focus on localization, and mechanisms and methods for scalable engagement of local faith networks. Next steps will include updating the operating plan and developing a new communications plan. Outcomes from the meeting will be posted to our website shortly. 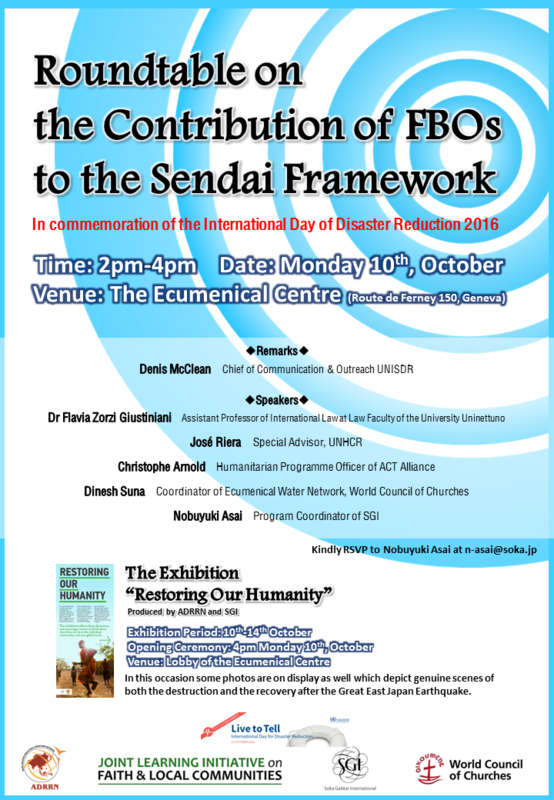 On October 10, JLI partnered with Soka Gakkai International, the World Council of Churches, ADRRN to discuss Faith-Based Organization’s contributions to the Sendai Framework and disaster relief reduction (DRR). The discussion at the Ecumenical Centre in Geneva, Switzerland included the presence of UNISDR and UNHCR. Co-hosted by the African Council of Religious Leaders, GHR Foundation, USAID, Religions for Peace and The Global Women of Faith Network , under the auspices of Cardinal John Onaiyekan and the Sultan of Sokoto. 300 religious leaders and heads of FBOs gathered to explore activity and contributions to peace and prosperity. A resolution unanimously adopted by the assembly called for interreligious collaboration to end extreme poverty and to address the underlying causes of violent extremism. JLI moderated a session on humanitarian response, with a short presentation including the 5 Evidence briefs on religious and faith based response. Religious leaders from across the continent offered specific examples of religious and faith-based response to local humanitarian challenges. The first annual meeting of the Partnership for Religion and Development ( PaRD) gathered gathered some of its 5 bilateral, 10 multilateral members, and 5 guest members for discussion of progress and planning for the work ahead. PaRD elected its first fourteen FBO partner organizations, including the JLI, Alliance for Religions and Conservation, Arigatou International, GHR Foundation, and Global Ethics, Religions for Peace and the World Council of Churches. The Sultan of Sokoto together with IIPC, led by Imam Magid and Imrana A. Umar and UNDP, hosted by top Uluma from seven West African countries for a two day working discussion on how to ramp up religious leadership to counter violent extremism. The Sultan chaired the intense discussions which resulted in the Declaration. The Network of Religious and Traditional Leaders and IIPC briefed inter religious leaders on the Marrakesh Declaration. The Declaration was a revelation to most of the participants. Muslim and Christian speakers from the floor noted the reciprocal benefits of the Declaration with regard to protection for all religious minorities. The Declaration was warmly received, with calls from Christian leaders to develop an analogous document drawing on Holy Scripture for protection of the rights of minority religions. A USIP fellow announced that he had translated the document from the original Arabic into Hausa. JLI is honored to be admitted as one of the first partners of the International Partnership on Religion and Sustainable Development (PaRD). PaRD is a network on religion and development to enhance cooperation in achieving the 2030 Agenda together. PaRD elected its first fourteen FBO partner organizations, including the JLI, Alliance for Religions and Conservation, Arigatou International, GHR Foundation, and Globalethics.net Foundation, Religions for Peace, Buddhist Global Relief, Danmission, Milstein Center for Interreligious Dialogue, Muslim Hands, Muslims for Progressive Values, Side by Side: Faith Movement for Gender Justice, World Association for Christian Communication, and WCC Armenia Inter-church Charitable Round Table Foundation. Thoughts from Sadia Kidwai and Elene Fiddia-Qasmiyeh, JLI Refugees and Forced Migration Co-Chairs on the UNGA Summit on Refugees and Migrants. They also share about the purpose of the newly-established JLIF&LC Refugee & Forced Migration Learning Hub to begin addressing such questions and evidence gaps on the intersection of faith and forced migration. JLI’s first Refugees and Forced Migration Hub in-person meeting will be during the upcoming September UN General Assembly meetings. Date and time: September 19 (6-8pm EDT), after the UN Summit on Refugees and Migrants. Light supper will be served. You will be able to dial-in or log-in online, in case you cannot come to the meeting in person. The Refugee and Forced Migration Hub brings together expert stakeholders in areas related to religion, faith, migration and refugees as well as practitioners, policy makers and academics. The Hub is co-chaired by Sadia Kidwai of Islamic Relief Worldwide and Elena Fiddian-Qasmiyeh, Co-Director of University College London’s Migration Research Unit. Introductions and exchange of information about members’ interests and work relating to the Hub topic. The Refugee and Forced Migration Hub is a part of the Joint Learning Initiative on Faith & Local Communities Learning Hubs (JLI&LC Hubs), which narrow the focus of enquiry about evidence for faith groups’ activities and contributions to community wellbeing to selected sub-topics. For more information, see the Refugee and Forced Migration Meeting Notes and Hub draft TOR from the first teleconference. PaRD is a network on religion and development to enhance cooperation in achieving the 2030 Agenda together. Please visit www.partner-religion-development.org and create an account at the bottom of the page under PARTNERS. Once your account has been created, you may access the registration form by log- in. You can take your time to gather all the required information and documents, because all progress on the form will be saved. You may continue filling in the form by simply logging in again at a later stage. As soon as you have filled in the form, click submit and wait for the confirmation.